One place I like to go, from time to time, to rouse my spirits and draw me closer to the heart of God is Wendell Berry’s Manifesto: The Mad Farmer Liberation Front. Berry’s words are good for us to hear right now, because “all the facts” include the reality of living in a country with a deeply ingrained racism habit that we just can’t seem to kick. The Deacons and I were praying Wednesday night in the back of our sanctuary, right about the same time another group of believers was praying in a Charleston, South Carolina church…. People of color in this country continue to suffer at the hands of racist persons and racist systems that perpetuate their mistreatment. And yet Jesus “lies down and sleeps in peace,” as the Psalm says. Mark 4:35 says, “That day when evening came, [Jesus] said to his disciples, ‘Let us go over to the other side.’” From what I can tell, evening can be a good time to catch fish, but to traverse a lake…? When you’re out camping and sunset comes, you try to set up camp, not embark on a new leg of your expedition. Jesus and the disciples just went. But, no, verse 38 says, “Jesus was in the stern, sleeping on a cushion.” He needed his introvert time. He found a pillow, or a big sandbag, and put his head on it. The disciples take this as apathy, some kind of a cruel joke. Which probably makes the disciples all the more upset. 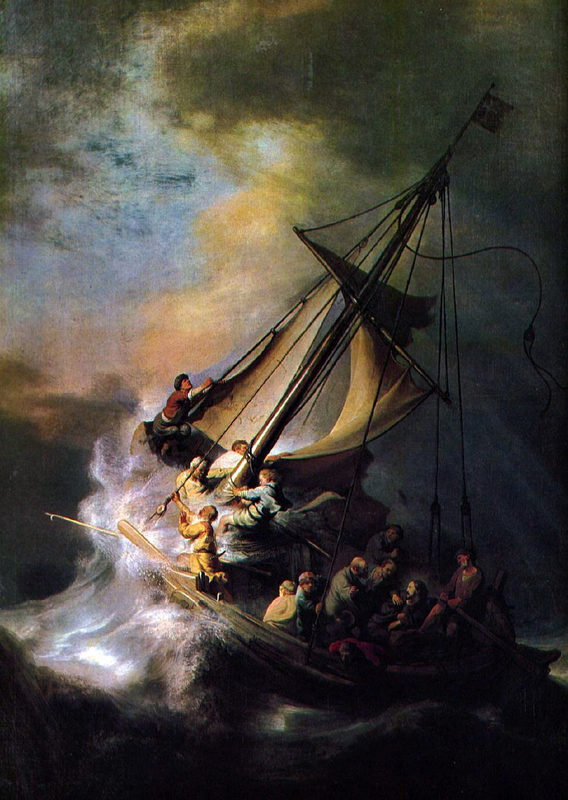 You wonder… if Jesus knew this storm was coming, is that why he was at the stern, elevated above the rest of the boat? And if so, the reader of this text wonders, why didn’t he quell the storm before it started? Or give the disciples a heads-up? Mark doesn’t tell us. 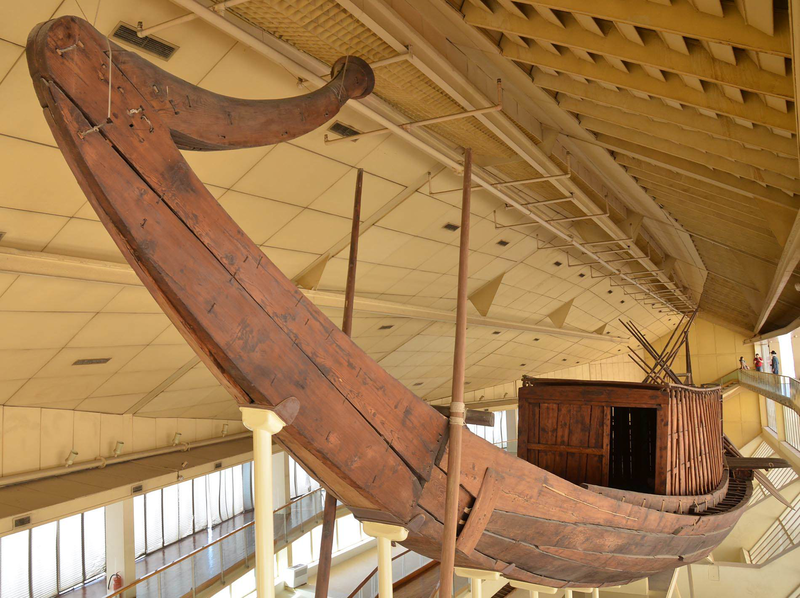 The specific wording Mark uses in the text suggests that the boat was filled “to the extent of its capacity” (HT). The text says it goes from a “great” windstorm to a “great” calm. Jesus talks directly to the wind and the waves. Can you think of another person in biblical history who talked to the waves and the sea, and told them to do something? I don’t know if the disciples, in that moment of fear, would have had Job in mind, but the kind of thing Jesus is doing in this passage is the kind of thing that only the LORD God Almighty does. Here he is. God himself, in the boat with the disciples. 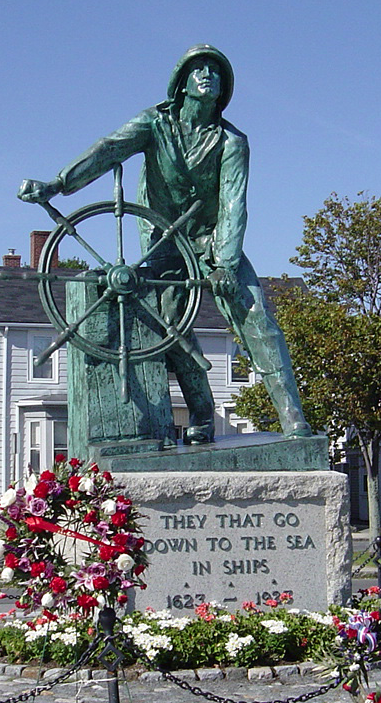 “They that go down to the sea in ships,” the inscription reads, 1623-1923. What about those who go unrescued? 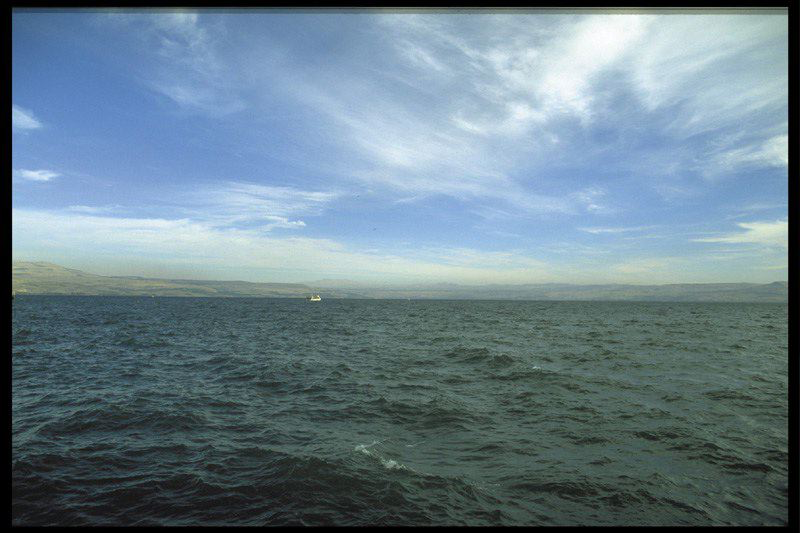 And the Psalm goes on to describe the wind and the waves. Those at sea “reel to and fro… and are at their wits’ end.” Surely this describes the lives of those lost at sea from 1623 to 1923, and before and since. But herein lies a theological difficulty. 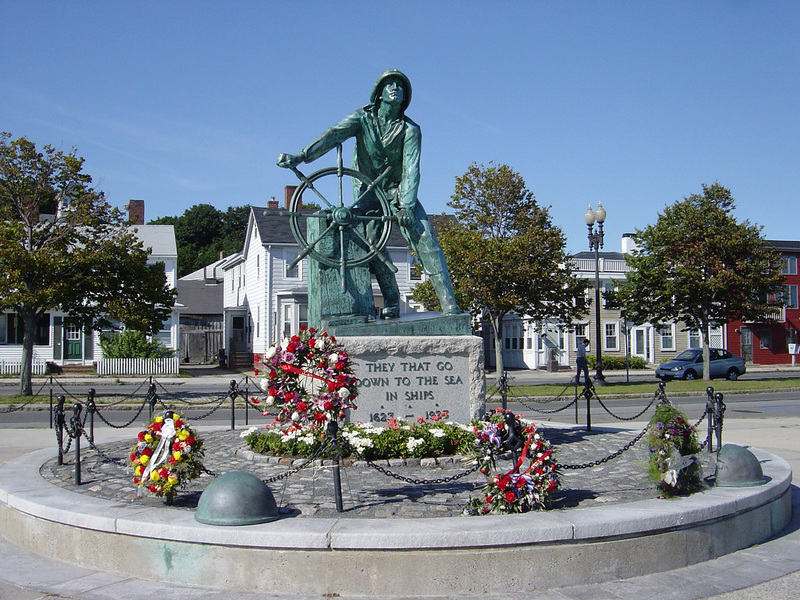 I don’t know how many fishermen cried “unto the LORD in their trouble” in stormy seas, but the memorial in Gloucester stands there to honor those who were not brought out of their distress… or at least, not brought out of a storm. There are some storms–literal and metaphorical–that God just does not make calm. Unlike the ones the Psalm 107 goes on to describe, these men and women that the man at the wheel stands for were not rescued. It’s one of the perplexing questions that confronts us—why a God who can and does intervene so often… just lets some things go… lets some evils move ahead. Allows men and women to get lost at sea. The 9 members of Mother Emanuel African Methodist Episcopal Church barely had time to “cry to the LORD in their trouble.” And though Jesus was in attendance at that Bible study and prayer time—“Where two or three are gathered in my name, there I am with them”—he didn’t stop the hateful actions of a deeply racist young man. Surely those 9 didn’t have to die. I don’t know how many more of these things it will take for our nation and lawmakers to finally move ahead in a serious conversation about gun control. I don’t know how many more unarmed black people will have to die before our country wakes up to the pervasive racism in our midst. They didn’t have to die. But, you know what? In the lexicon of the Kingdom of God, dead isn’t really dead. Because you can kill a person, but you can’t kill love. You can try to cut somebody down, but “the blood of the martyrs is the seed of the church.” From even horrible death can come new and powerful expressions of life. The African American Church… really has seen it as its responsibility and its ministry and its calling to be fully integrated and caring about the lives of its constituents and the general community. We… don’t see ourselves as just a place we come to worship, but as a beacon, and as a bearer of the culture and a bearer of what makes us a people. But I like to say this is not unique to us. It’s really what America is about. Could we not argue that America is about freedom? Whether we live it out or not… but America’s about freedom, equality, and the pursuit of happiness. And that’s what church is all about. Freedom to worship and freedom from sin, freedom to be fully what God intends us to be… and have equality in the sight of God. And sometimes you gotta make noise to do that. Sometimes you maybe have to die… to do that. We saw this week how the family members of the victims responded. 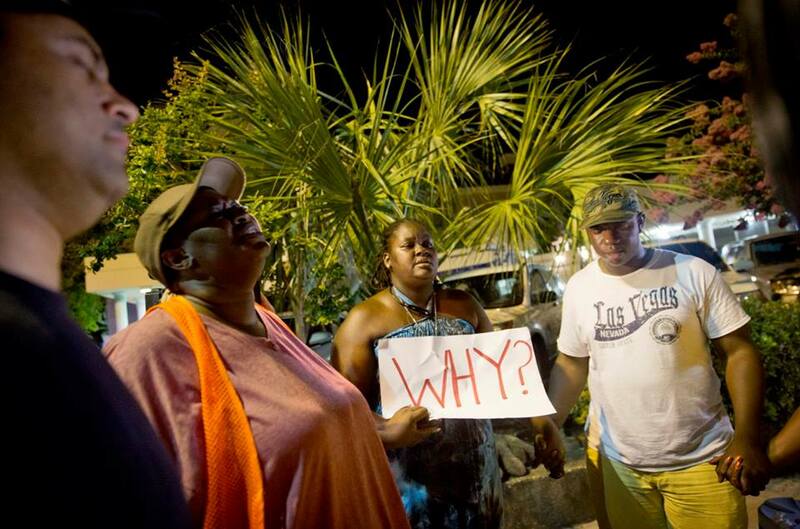 They called on Dylann Roof to repent of his sins and believe in Jesus. As Rev. Pinckney suggested, they called him to a life of “freedom from sin, freedom to be fully what God intends [him] to be.” They said things like, “Though every fiber of my being is hurting, I forgive you.” And the nation watched, amazed at the witness of the families in that church. And so God, working through the amazing mercy of the families, calms the storm, after all. The winds of hatred and the breaking waves of destruction die down as Christ works in the hearts of his disciples in Charleston who choose faith over fear. 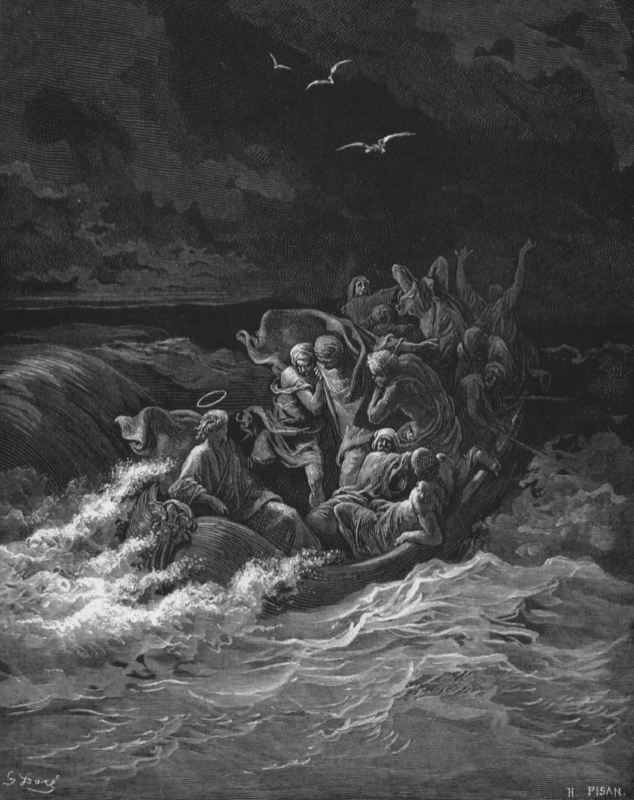 When God’s children find themselves in choppy waters, our Lord, Jesus, is right there with us in the boat. And because they know Jesus is in the boat with them, the families of Mother Emanuel have chosen to be joyful, “though [they] have considered all the facts,” though their loved ones have been lost at sea, as it were. Not a sudden storm, not even a tragic shipwreck can keep Christ’s disciples from making it to the other side. There they see the works of the LORD, and their witness lives on. The above is adapted from the sermon I preached today at church. Previous Post Charleston, S.C.: What Can We Say?